Gee, I guess this doesn't look too promising. The guy said it ran but was knocking. Yeah, I guess. I've always been too gullible. I hope you paid an extremely low price for that engine. Broken piston and D chunked cylinder? I am sorry for your loss. Is the crank shot? Actually, the heads look pretty good. No signs of impact. If the 3.6 crank is clean you may want to consider using it along with the Nickies and end with a very sweet engine..
...just before it went BANG! How about this, use the good crankcase half from your 3.2 and the good half from the 3.6 and build a 3.4? ... slightly unbalance. Hit it with the hone and call it good. This is as far as I’ve got so far. Bank 2. I’ll open the other bank and keep looking but I doubt that the core is recyclable. I would have thought the "knocking" mentioned by the seller was due to the IMSB. After you get it all apart talk to Charles Navarro. The cylinder in your picture still looks like something that could be repaired with Nickies. When I was exploring rebuild options, Charles told me that if LN/RND rebuilt my engine, they could source a good used crank that had been magnafluxed and inspected for about $2,000 if I needed it. In the end I had my local shop rebuild my engine, as they had torn it down to see what damage there was. extra cost to repair cylinder? all the bearings, gaskets, chain ramp and pads, chains, etc.? shipping of the block to/from usa from canada? $15k easy. and that's not valuing your labour. you can buy a running 3.6L X51 for that. consider selling the heads to try and recover what you paid for the core and go back to square one. No, your costs are way off the chart. op posted the cost of his core at $1500 cdn already. $2k usd for crank was from previous post. you can gamble on ims bearing (note the results in this thread if you lose that bet) but vendor here has bearings averaging around $750 usd, not to mention tools and other bits that will have to be replaced. Steel sleeves and closed deck conversion maybe. Question, what makes you think the crankshaft is "95% toast" ? Cranks are incredibly durable, and built and balanced for stress. Step one would be to disassemble and analyze the parts before making any $ conclusion. 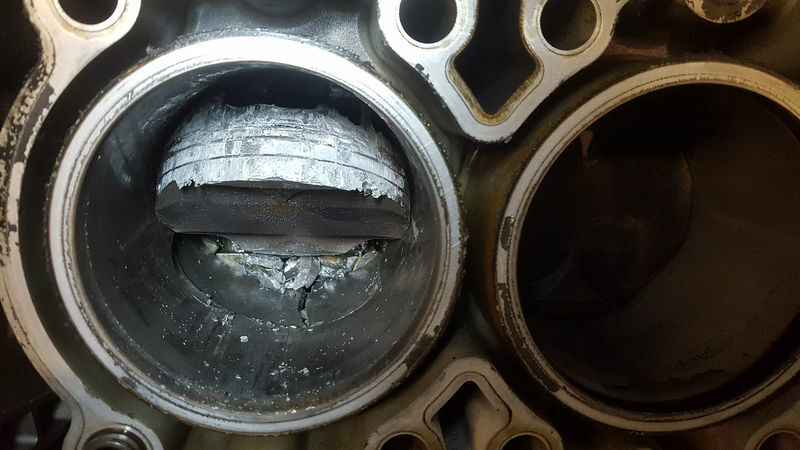 If I was to wager, the crank is fine, the piston is gone and connecting rod is probably cracked. OP, if you really are convinced its a 15k mess, I will buy it from you for 5k and fix it myself and keep it.